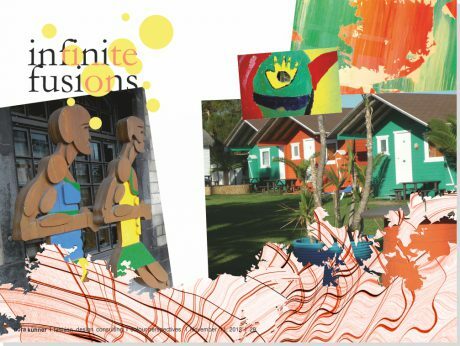 The IDEAS colour forecast for summer 2014 opens up new horizons for a world which has been facing for years crisis, trouble and fear. We have to look beyond the everyday and create new visions for tomorrow. 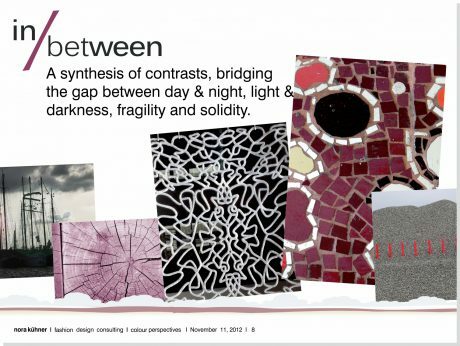 A synthesis of contrasts, bridging the gap between day & night, light & darkness, fragility and solidity. A sophisticated array of colours – austere black & white smoothed by subtle shades of grey and dusty rose. Injections of fluorescent glowing pink highlight the scenery. Fabrics linking fashion and functionality. Synthetic fibres blend with wools. Patterns draw inspiration both from photography & hand-crafted moisaics. Caught up in unbridled imagination and day-dreams. New universes seen from a distance through a misted lens. Refined pastel colours get a funky touch by fluorescent acid lime. A harmonious and sensitive colour range with delicate airiness. Functional properties with a soft & dry handle. Cracked effects on fluid surfaces. Scattered layers of prints produce 3D effects. Curvaceous & fragile line drawings. 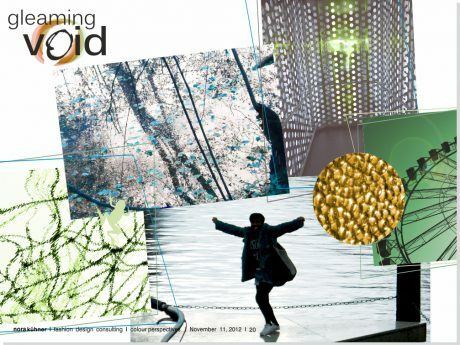 Touching a distance … Breaking out of model thinking, giving shape to new ideas. A pioneering spirit accompanied by rational thinking. A subdued yet luminous colour range. Fresh aquatic shades of blue and green are highlighted by sunny yellow. Dark earthy burgundy sets delicate accents. High performance at its best. Latest technology – clean and pure. Lightweights go to their boundaries. Refined fabrics with high density. Detailed geometric patterns play with light & shadow. 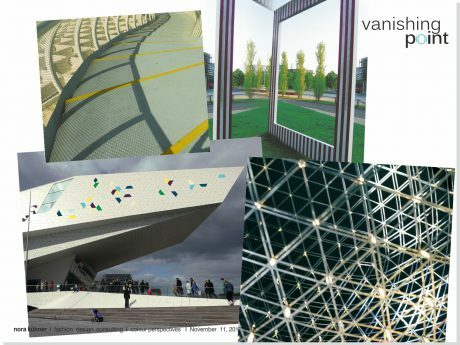 Sculptural architecture inspires surface design. Seeking the promise that lies beyond the horizon. Exploring both real and virtual landscapes modelled by lucid light – irresistible and poetic. Colours are based in nature and full of energy. Slightly dried by the sunshine or washed out. A gentle and enveloping range of yellow, light shades of green and papaya reds. A very light sky blue and a deep sea blue cool down the atmosphere. Blends of natural fibres with polyamide. Geometric forms repeat to shimmering infinitiy. Prosaic urban surroundings turn into a land of adventures. Sparkling with creativity and new ways of thinking. Celebrating diversity instead of uniformity. Strictly artificial colours. Varying from cheery brights like quirky pink, lemon sorbet and sweet candy to dimmed shades of olive, mauve and mustard. Focus on summer fleece & brushed knit. Graphics mix organic shapes & streamline geometry. Bold flower prints recall traditional cross-stitching. Enhancing our knowledge and skills by discovering other cultures and their treasures. Shaping a new universe by interweaving the global heritage of crafts with contemporary technological developments. Bright primary shades at the core of this range. Grounded by night blue. A vibrant and strong mix filled with optimism. 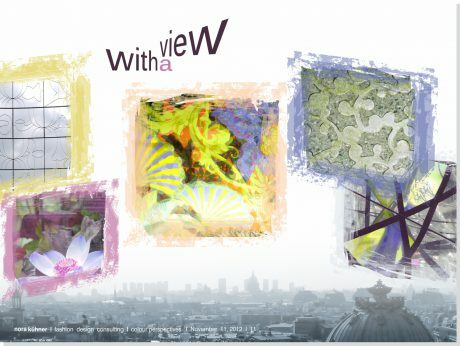 Fabrics link functionality & fantasy. Graphics adopt patterns across the globe. Nearly dematerialized gradations of colour. 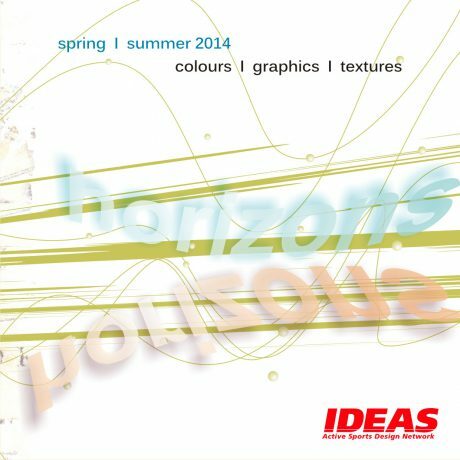 The complete IDEAS colour forecast summer 2014 (62 pages with graphic inspirations & recommendations for colour combinations) can be purchased exclusively by direct order via e-mail: news@ideas-designers.com. Winter 2014/15 delights in a strong black and white statement. Refined shades of grey and dark burgundy underline the subtle nobleness of this theme. Injections of sulphur yellow add an active sports feeling. 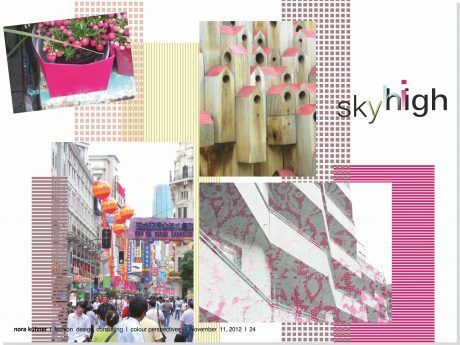 The second colour story draws inspiration from tonal gradation of pinkish red. The range is completed by frosty shades of sky blue and deep mint for a delicate yet luminous colour mood. Blue – the magical colour of space oscillates in numerous and rather diverse shades. This story is strictly forward-driven and dedicated to technical progress. Fitting perfectly for high performance wear. Another vibrant story plays with the tension between strictly artificial colours like lilac and sulphur yellow and delicate earthy tones. Metallic coolness broken by natural warmth. The IDEAS colour forecast for winter 2014/15 will be available by January 31, 2013.